"Nature is putting on this once-in-a-lifetime show and people supplemented with fireworks. It felt very American." 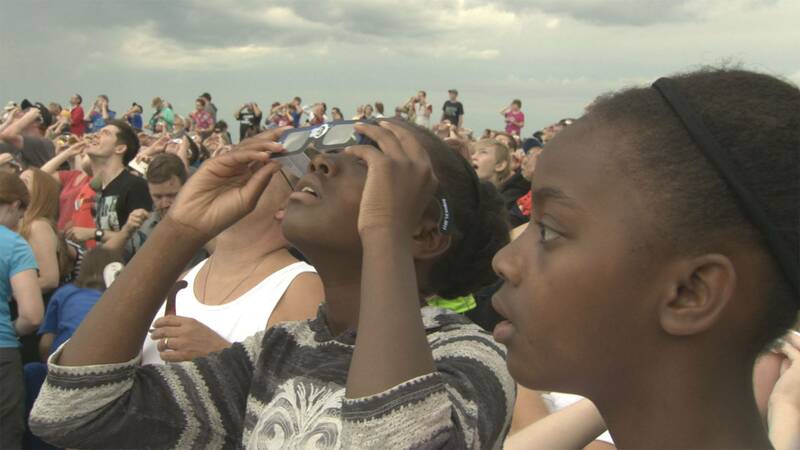 PBS: The film takes us to numerous locations in Nebraska where people began to gather for the solar eclipse. Can you take us behind the scenes and tell us more about what went into the production of this film? Chad: A lot of anxiety! And a lot of teamwork. While Brian and I are the names on this piece for [the PBS Online Film Festival], there were a dozen people total contributing in the field or in post-production. This would definitely have not been a success were it not for the whole team contributing their best thinking. The day of the eclipse the weather was obviously dicey. We knew we were fine out in western Nebraska but mid-state (where I was) and east (where the bulk of our cameras were set up) it was cloudy and raining. By mid-morning I knew I was in the clear but, as the film shows, it was touch and go until the end for most folks in Nebraska. But for all the pre-production anxiety, the hard part was post-production and trying to glean the story from all the footage. That’s nothing new in filmmaking and the story, of course, seems obvious now, but we spent a lot of whiteboard time moving segments around and trying to figure out the right shots so that it flowed well. Brian: We wanted to capture the full breadth of a “Nebraska eclipse.” This meant going to one of the largest events, at a National Monument where the first homestead claim was filed, as well as to quiet places, where only the birds and the river witnessed the event. The shooting (in retrospect) was the easy part. We simply talked ahead of time about where we wanted to be, where we needed to be at certain times to get the shot we wanted and geared up! We deployed a team of 10 people at places throughout the state. 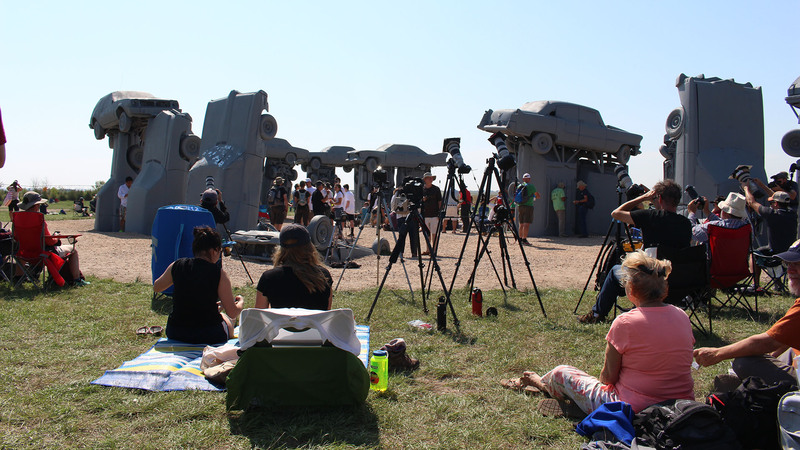 Some venues had multiple cameras and people, and others (like Carhenge and the Platte River) had one person. The Homestead Monument had a crew of three people with multiple cameras. In post, we really pushed the ideas of the new medium. I wasn’t sure we could jump throughout location-to-location and back again without completely confusing the viewer. Initially, we released single-camera experiences for social, just a shot and the moment, and let them play out. Then, we began experimenting with the voice of Bill Nye from that day. He speaks so well to the communality of the experience - that this is a singular lifetime experience which should help unite us in the recognition we are all here together on one planet under one sun. Once we had this narrative set, we began seeing if we could bring out the real driver of drama that day: the weather. Did we have enough moments to make everyone understand that this key moment was so near to being quashed by clouds, dashing the hopes of thousands at Homestead National Monument? Chad, who had nary an idea of drama with the clouds at his clear location in the center of the state, had initially worried this project could’ve failed based on weather alone. Why not now delight in that drama in the editing suite? It is worth noting that 360-degree video technology and production has evolved so quickly in the time since the video’s release, we wish we had the chance to do it again! PBS: What was it like to witness such an extraordinary event and to see the reaction of everyone around you during the making of the film? Chad: I think Brian and I had two very different experiences. Brian ran the crew at Homestead National Monument with all of the crowds, while I went solo out to the Rowe Audubon Wildlife Sanctuary near Gibbon, Nebraska. I found a nice secluded spot by the river without people around. But even at that, when totality occurred I could hear people cheering off in the distance. And fireworks. That cracked me up. Nature is putting on this once-in-a-lifetime show and people supplemented with fireworks. It felt very American. Brian: I was stationed at Homestead National Monument where it was estimated the crowds were as big as 6,000 people. Bill Nye was a big draw. There were musical acts and guest speakers on a stage, along with a concert-like atmosphere. I had my moments of wanting to be where Chad Davis was positioned – tucked in along the quiet of the Platte River, nary a soul around. Meanwhile, I was attempting to shoot some traditional video along with 360-video, fighting crowds and swearing off clouds. It felt miserable and overwhelming. But, there was a moment, (you can see it in the video) when the clouds parted and the crowds cheered in unison. Children held out their hands and screamed in delight, adults jumped up and down. It was beautiful. I did not see the eclipse for myself, because I was shooting, eyes buried in a viewfinder, but I did witness perhaps the best moment of humanity in my life. Watching the faces of others completely moved me. It still does today when I watch our video of it. I was completely thankful for the experience.